The Airhead Popsicle Kids iSUP is in every way a treat for your hungry youngsters. The first thing that stands out about the Popsicle SUP is its bright and fun colors. It’s not too childish like the Bimini iSUP, but it’s the right combination of merry for both kids and tweens to enjoy. It’s on the shorter end of the stick when it comes to length at only 7 feet long. However, the Popsicle is super stable and comfortable to ride being 30 inches wide and 6 inches thick. Kids certainly have an amazing sense of balance, and they’ll catch the hang of SUPping faster than you think. To kick up the fun, hook up a towing line to the nose and take your youngin for a spin. Make sure they’re attached to their board on the lake with an ankle leash to the tail. These are the two most important d-rings you’ll ever need on a kids iSUP. The Popsicle is lightweight at only 19 pounds to make it easy for the kiddos to tug around. The company even throws in a board strap for convenience. The orange kick pad is an awesome feature. It’ll help to get your kids pivot-turning like a SUP pro. The board has a rockered nose and tail to ensure your newbies enjoy a smooth paddle. 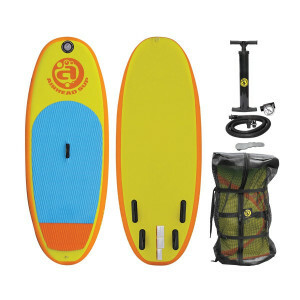 You’ll be more than excited about the quad fin setup, great skin, and extra accessories, you’ll be paddle-crazy for it! The small size of the paddle board makes it a trooper for flat water and recreational use on the lake. The kids will get a good thrill with it in small swells in light surf too. Because it’s only 7 feet long, it’s best for young riders between 30-120 pounds, that’s about ages 5-10. While older kids might meet the weight limits, they might find it too short, however, we’re pretty sure the kids won’t care. 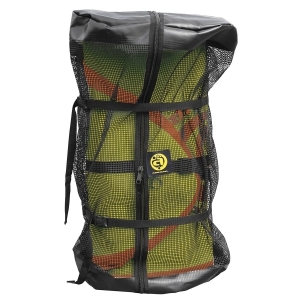 The Airhead iSUP is praised for its value when you can find it for a cheaper price on online retail sites. However, its full price may shock you for a kids iSUP, but those that have bought it haven’t regretted their decision. While it does lack on-board storage because there are no extra d-rings or bungees, d-ring kits are relatively cheap and can be glued on DIY-style. While the board does provide a smooth paddling experience for the kids, it mightn’t track as straight as an adult might expect. Seriously though, the kids aren’t going to mind at all. It’s just about getting on the water and having a great time. If you’re going to be nit-picky about tracking, you might want to find another board. The quad fin setup is an excellent feature for extra stability to help your kiddos feel even more safe and stable. Peace of mind for parents is priceless! What is the Quad Fin Setup? This Popsicle iSUP has four fins to improve stability, maneuverability, and down-the-line speed without the drag of a center fin. It also allows the rider to maintain control while paddling, especially in surf. How is the Quad Setup Better than the Thruster and Twin? It’s not a matter of what’s better and superior. Instead, it’s about what performance and control aspects you want from your fins. The quad setup provides the benefits of both the thruster and the twin fins without the drag of a center fin. This improves speed to slice through flat water improving tail maneuverability. It also provides more control and stability versus the twin. Are the Fins on the SUP Removeable? No, the quad fins are attached to the iSUP. However, they have a bit of flex in them and are quite small, so they’ll be less prone to damage. Is the Airhead Popsicle iSUP Fast? While the fin system certainly helps to improve speed, the round and wide shape of the board actually slows it down. 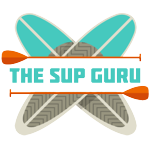 However, this isn’t a race SUP, it’s a recreational SUP for kids. How does the Popsicle Inflatable SUP Perform Best? While it might not be a speed freak iSUP, it’s strongest performance is in its stability and ease of paddling. This is very important for young SUPpers. Does the Airhead Kids iSUP come with a Paddle? A paddle isn’t included in the purchase. You can purchase the Airhead Youth SUP Paddle that can be broken down into three pieces. The shaft is aluminum and the blade is fiberglass. It’s adjustable from 52-74 inches, perfect for paddlers from 43-65 inches tall. 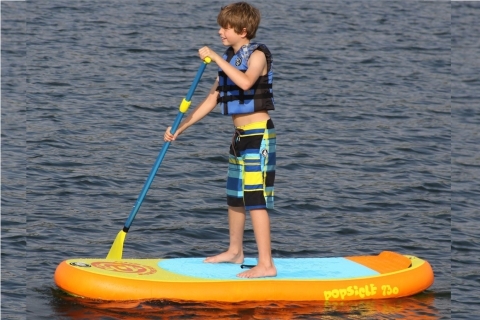 Is the Popsicle Kids Paddle Board easy to Inflate? 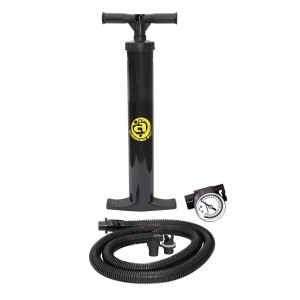 The high pressure pump with gauge that’s included in the purchase is a decent hand pump. The board is faster to inflate than other iSUPs because it’s much smaller. Who makes the Airhead Popsicle Paddle Board? The iSUP is made by Airhead SUP Boards & Accessories. They are owned by Kwik Tek, Inc. that’s been in business since the very early ’90s. Both companies are American and based in Colorado. The Lucky Bums iSUP is another board that’s available in the 7 foot length, but this one includes a paddle in the purchase. It also has plenty of d-rings for extra hookups, and it matches the weight capacity of the Popsicle. If you can find it on sale, it’s even cheaper than the Popsicle! If you want an iSUP where you can choose the color and even the skin design, the 7’7″ ibigbean Kids iSUP is worth a peek. It can hold a lot more weight, and it’s also slightly slimmer than the Airhead. If you want more info on the comparable kids iSUPs, check out our full reviews on them here. To SUP (sum) it up, the Airhead Popsicle Kids iSUP is a colorful buy for kids that want a colorful experience in flat water or in light surf. As a parent, feel at ease that every feature is maximized to enhance an enjoyable, smooth, and safe SUPping paddle adventure!